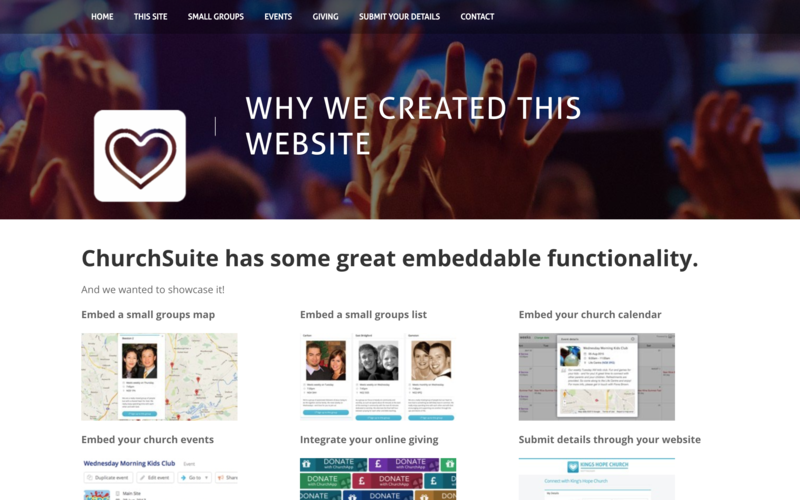 ChurchSuite makes it really easy to embed certain features into your existing website. Embedding is suitable for all websites, including Wordpress sites, and doesn't require lots of technical "know how" to achieve! You'll simply copy and paste a single line of embed code, supplied from within your ChurchSuite module's option, into the source code section of the appropriate page of your website. Within the module's options is an embed code generator that can be used to customise certain elements of the feature that is being embedded. Once embedded, the content remains up to date so that as new data is added or updated in ChurchSuite, your website stays up to date too! My Details - a newcomer/visitor connect form that enables individuals and families to submit contact details and areas of interest via your website. Donate - our online giving platform - can be embedded, or you can embed a custom button with a link to Donate. Small Groups lists and a map. Further information about the above embed features can also be found in the related support articles below. ChurchSuite also provide a developer API (for full suite customers) and access to JSON feeds.